Night two of the Southern Zone South Sectional Championships began this evening in Orlando, Florida. The preliminaries went off early this morning, with the top-32 swimmers qualifying for tonight’s finals. The 800-meter freestyle relays were the only events swum as timed finals this evening. Tonight’s events were kicked off by a tie from a couple of youngsters in the women’s 200-meter freestyle. 14-year old, and 800-meter freestyle champion from last night, Olivia McMurray and 16-year old Mary Smutny swam the same exact time, in 2:03.05. Since there was a dead heat, there was no silver medal awarded, so Andreina Pinto earned the bronze with a time of 2:03.99. Polish national Jan Switkowski took the gold in the men’s version of the race with a swift 1:49.16. Switkowski was closely followed by Gator Swim Club’s Khader Baqlah who turned in a time of 1:49.54. Baqlah’s teammate, Corey Main, earned the bronze with a time of 1:51.97. The 100-meter breaststrokers dove in next in the Orlando YMCA Aquatic Center. The women saw Alia Atkinson take the gold by three full seconds, in a final time of 1:07.61, which is just off the FINA ‘A’ time of 1:07.58. FSU’s Natalie Pierce, who is following up on her stellar performances at World Championship Team Trials last week, touched second in 1:10.61. Blue Dolphin’s Taylor Grabenhorst walked away with the bronze tonight by turning in a time of 1:12.86. Grant Sanders, who is registered as unattached, but swimming with Tampa Bay Aquatics, took the win in the men’s version of the race by turning in a time of 1:02.68. Sanders did not run away with his victory though, as he was followed closely by FSU graduate Jared Pike who touched the wall in 1:03.05 and even closer behind Pike came former FSU teammate Juan Sequera. The backstroke splash n’ dash was next this evening with the women going off first. Gator Swim Club’s Caitlin Brooks had her first victory of the meet by out-touching FIU swimmer Skye Carey. Brooks turned in a 29.27 to Carey’s 30.03. Fabiana Ingram out of Lake Lytal Lightning snuck in for the bronze with a 30.27. 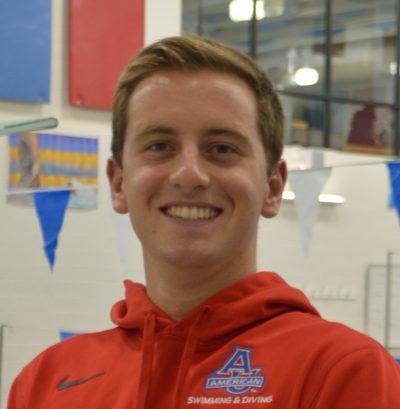 It was an exciting day in the Main household this evening as Gator Swim Club’s Corey Main pulled off his second podium appearance of the evening by touching first with a time of 26.15, he was trailed closely by collegiate teammate Dakota Mahaffey, who turned in a 26.76. Corey Main’s younger brother Bayley Main earned the bronze to join his brother on the podium. Alia Atkinson was back for some more this evening, pulling off a tough double in the 100-meter breaststroke and 100-meter butterfly, winning both events in the process. Her gold medal time was 59.94, the only swimmer to break the 1:00 barrier. Isabella Paez out of Miami Metro Aquatic Club came close with a 1:00.47 and Talia Bates from Gator Swim Club swam a 1:01.21, good enough for the bronze. Atkinson was not the only swimmer to earn two gold medals tonight, as Jan Switowski earned his second gold, this time in the 100-meter butterfly with a time of 53.51. Grant Sanders was another athlete taking on the quick turnaround. Sanders touched second, a little over a second behind Switkowski, in a 54.52. Young star Sterling Crane out of Episcopal Amberjax earned a bronze with a 55.57. Next we handed off to the masters of all four strokes; the 400 IMers. The women saw South Florida’s Kathleen Golding swim away with the win by almost four seconds with the time of 4:50.65. Scarlet Aquatic’s young gun, 14-year old Junseo Kim, touched second in 4:54.56 and Highlanders Carley Lowe swam a 4:56.38 for third place. The men’s event saw Scarlet Aquatics dominate the A-final by turning in the five fastest times of meet. Starting off with veteran, 21-year old, Jonathan Gomez who swam a 4:25.25. His teammate Johannes Calloni earned the silver with a time of 4:27.83 while Jackson Karofsky earned the bronze in 4:28.66. Maicoll Gomez and Justin Torres rounded out the top-five sweep. It was relay time in Orlando, when the 800-meter freestyle relay went in the tank. South Florida swam away with the victory in the women’s race with a time of 8:26.12 while Gator Swim Club touched second in 8:30.29. Scarlet Aquatic’s of New Jersey put together a 8:32.89 for third place. The men’s relays gave an interesting show this evening, with the top two teams being ‘B’ relays. Gator Swim Club’s ‘B’ relay earned the gold in 7:39.03 while Scarlet Aquatics snuck in for the silver with a time of 7:44.77. Gator Swim Club continued their success in the pool with a bronze medal time of 7:45.85. Tomorrow’s event consists of the men’s and women’s 100-meter backstroke, 50-meter breaststroke, 50-meter butterfly, 200-meter IM, 50-meter freestyle and 400-meter freestyle. Full Results are available on Meet Mobile as Southern Zone South Sectional Championship.